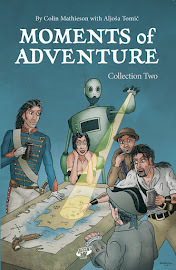 Moments of Adventure: ZULU Begins! Okay so I have been 'quieter' in recent times but there is a reason, or should I say 'reasons' , as apart from a wonderful wee anniversary trip to Belfast with Mrs M and a few other domestic activities, I have started on my next comics project, which not surprisingly involves........Zulus! 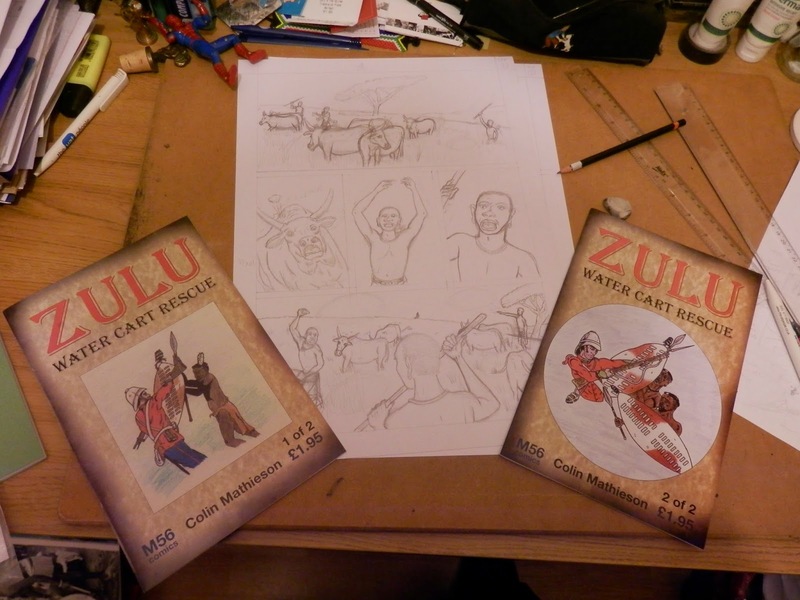 You may have seen that, much to my surprise, my remaining Zulu: Water Cart Rescue comic packs have gone well this year, selling out at comic shows in Birmingham, London, Belfast, Glasgow, Manchester and finally Helsinki where my last 3 packs all quickly went! The sold out 2014 ZWCR collector packs! This has greatly surprised me, given the age and subject matter of the books, but it seems that there is always interest in Zulu, which I guess the movie and of course Michael Caine have had a lot to do with. So anyway hastened by my Helsinki success and the encouragement of Dave West and Gary Crutchley I have seriously embarked on a project to collect both ZWCR issues together into a single volume with a 're-mastered' theme of new lettering and (hush) colouring and a brand new back-up strip which directly links to the original issues! Originally I was going to include my Day of The Dead Moon strip from Accent UK's sold out Zombies anthology book but fond as I am of this strip, the fantastical zombies theme doesn't really fit into Water Cart's intended historical accuracy - its based on a true event - so zombies were dropped and I therefore needed something new. Instead I've returned to Rorke's Drift and its aftermath and plan to tell a short story from the Zulu's perspective, hopefully incorporating themes (and maybe characters) from the original series. This is only planned to be a short 8-10 page story so we'll see how it develops. For all those interested in my comic work, you'll hopefully be pleasantly surprised by this news and no doubt even more amazed if I get this finished! 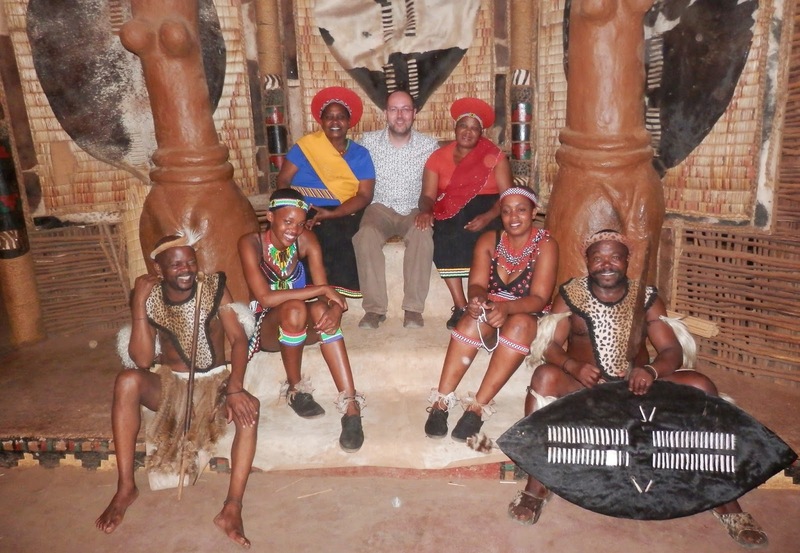 2014 field trip research for my new Zulu story! The new story, along with both ZWCR issues and some bonus features will form the remastered Zulu Collected Edition, hopefully appearing in time for the 2015 comic convention season. I've had a few false starts recently with my own comic story-telling and have several projects just waiting to go, so I really hope this will be the one to get me going again. Let's see, but in a hopefully fortuitous omen, Zulu the movie was on TV today, the day that I finished page 1's pencils JABULA! That's great news Colin ... and it only took us 10 years to get you motivated :o) can't wait to see this book on the table at Cons ... but I'm not dressing up as a Zulu to help promote it ... before you even think of asking. Don't worry Dave, you're costume's already on order! Thanks Gary, let's see if I deliver! I'm sure Dave can find an incentive if you can't. This is fantastic to hear, Colin - hooray! Usuthu Garen! I'll definately have to have a wee listen to that, hope you're kind to the classic movie that set me down this path!